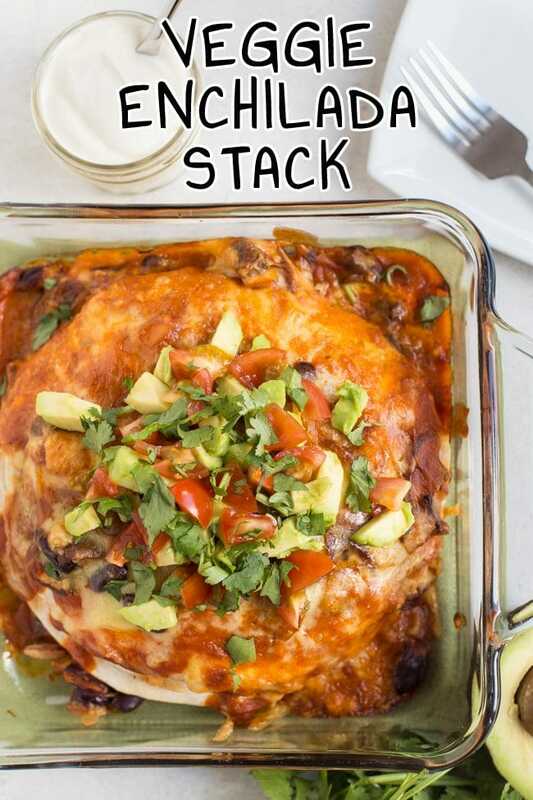 A simple weeknight dinner - veggie enchilada stack, with an easy homemade enchilada sauce. 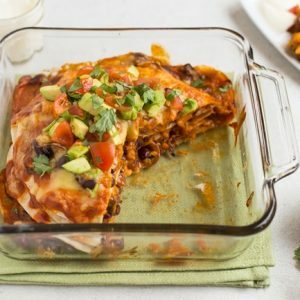 All the flavour of your favourite enchiladas, without the faff! Two cheesy bakes in a row, sorry! I must get more organised – though if you’re anything like me, you won’t be complaining. 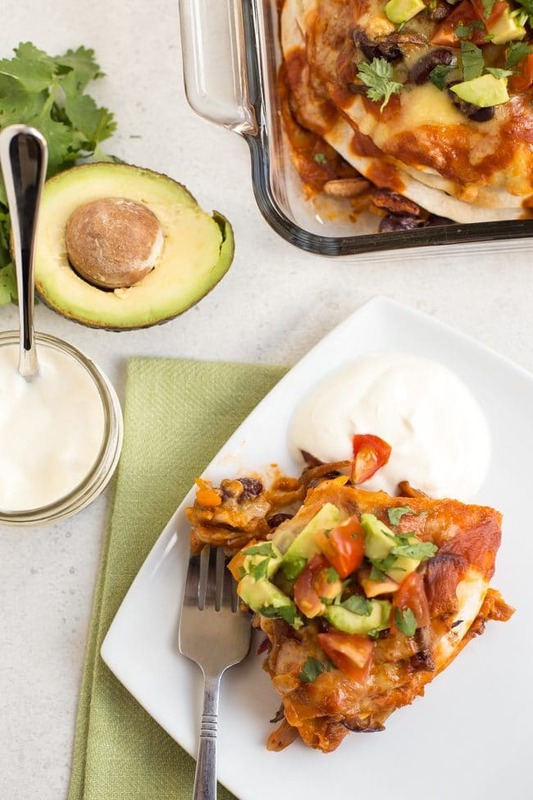 In case the mound of cheesy, saucy goodness in the photo above hasn’t yet convinced you that you need to make this veggie enchilada stack, let me describe it for you. 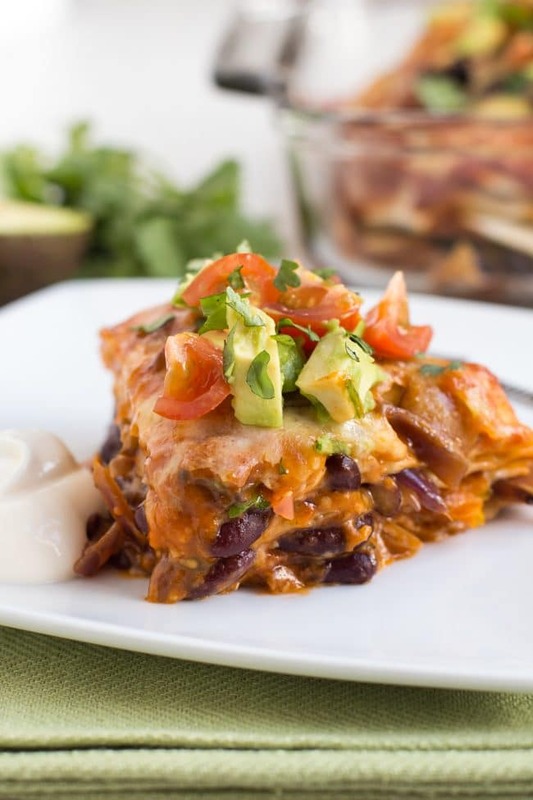 What’s in this veggie enchilada stack? – a nice big mound of toppings, to add a bit of freshness and really take it up a level! …does that not sound pretty amazing?! I’m a big fan of all kinds of veggie enchiladas (hi, my name is Becca and I’m a Tex-Mex addict), but an enchilada stack has the major bonus of being quicker and easier to prepare than the usual rolled-up kind. I’m definitely attracted to anything that makes life easier, and throwing stacks of flat tortillas into a baking dish is definitely quicker than having to fill and roll each one individually. 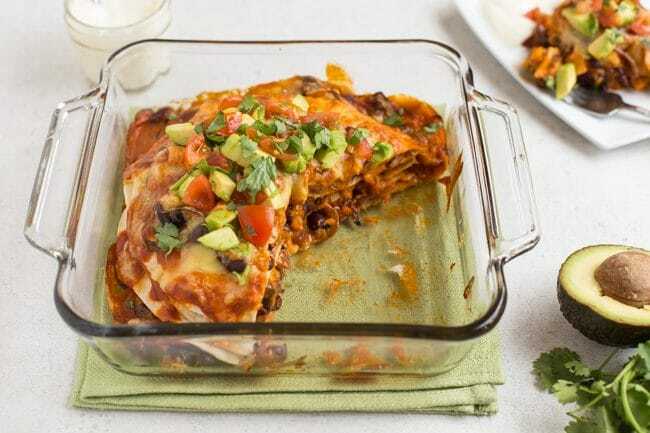 I guess the end result is halfway between veggie enchiladas and Mexican lasagne, which is no bad thing. Give me some spicy veggies and cheese in any combination, and I’m sold. If you want an even easier dinner (I salute you), feel free to skip the homemade enchilada sauce and use a jar instead. But it’s so quick to make that even I could be bothered (and I can’t be bothered to do much these days, with a 1 year old to chase around all day long). All you need to do is cook a few spices in a pan with a dash of oil until they’re nice and fragrant, then add a squeeze of tomato puree and some stock. That’s about it. The major plus of making your own homemade enchilada sauce is that you can tailor it perfectly to your tastes – you can use exactly what spices you like, and make it just the right level of spiciness. Once you’ve made your sauce and sautéed your veg, it’s time to get your stack on! Bake it until the sauce is bubbly and the cheese is golden brown (drooling yet?). Don’t forget plenty of fresh toppings – they really elevate the dish, and let’s face it, toppings are half of the fun of Tex-Mex food, right? Avocado, tomatoes, fresh coriander (cilantro), a big dollop of sour cream – or whatever else you fancy. To serve: your choice of fresh coriander (cilantro), fresh tomatoes, avocado, sour cream, etc. Heat a dash of oil in a large frying pan, and add the onion, garlic, pepper and mushrooms. Cook over a medium heat for 5 minutes, stirring regularly, until fairly soft. Add the kidney beans, and cook for a couple more minutes. To make the homemade enchilada sauce, heat a couple of tablespoons of oil in a small saucepan, and add the flour and spices. Cook over a low heat for a couple of minutes, stirring constantly, until fragrant. Add the tomato puree and vegetable stock, and whisk constantly until the mixture comes together into a smooth sauce. Simmer for a few minutes until the sauce reaches your desired consistency (add a dash more water if you'd like it to be thinner). To assemble the dish, add one small spoonful of the sauce to the bottom of a baking dish, and spread it around with the back of a spoon (this is just to stop the tortilla from sticking). Add a small flour tortilla, and top with some of the vegetables, cheese, and one spoonful of the enchilada sauce. Repeat with the remaining ingredients, layering upwards until you've used all of the veggies (the exact order and quantities doesn't matter - I ended up using 5 tortillas in total, so 4 layers of veggies and cheese in between). Finish the dish by pouring over any remaining sauce, and topping with any remaining cheese. It doesn't matter if you don't entirely cover the tortillas around the edges. Bake at 190°C (Gas Mark 5 / 375°F) for around 25 minutes, or until the cheese is crispy and the sauce is bubbling. Serve with plenty of fresh toppings - I added fresh coriander (cilantro), tomatoes and avocado on top, and served a dollop of sour cream on the side. 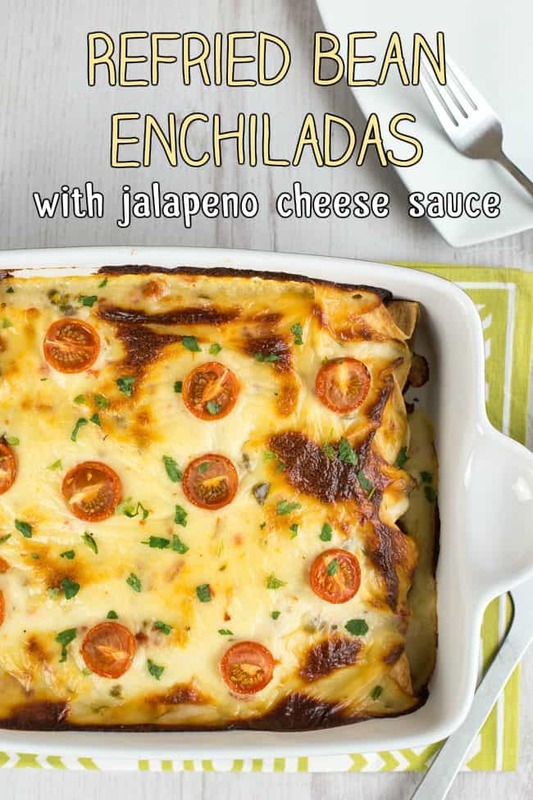 Here’s another of my favourite ever enchilada recipes: refried bean enchiladas with jalapeño cheese sauce! So tasty! I had some pancakes in the freezer, so I used them instead of tortilla, and it came out beautifully. I like to cook ahead and this froze and thawed with no problem. Thanks Stephanie, glad you enjoyed it – great idea to use your frozen pancakes! This is delicious, it’s by far the best veggie recipe I’ve made in a very long time. I shall be making it again very soon. Wow praise indeed, thank you so much Jane! Using veggies as a topping is a good idea. It’s a lot nice than just placing some lettuce on top. WOW ! This looks so good. Thank you so much for the inspiration! I would never complain about too much cheese – there’s no such thing :) This recipe looks really tasty! 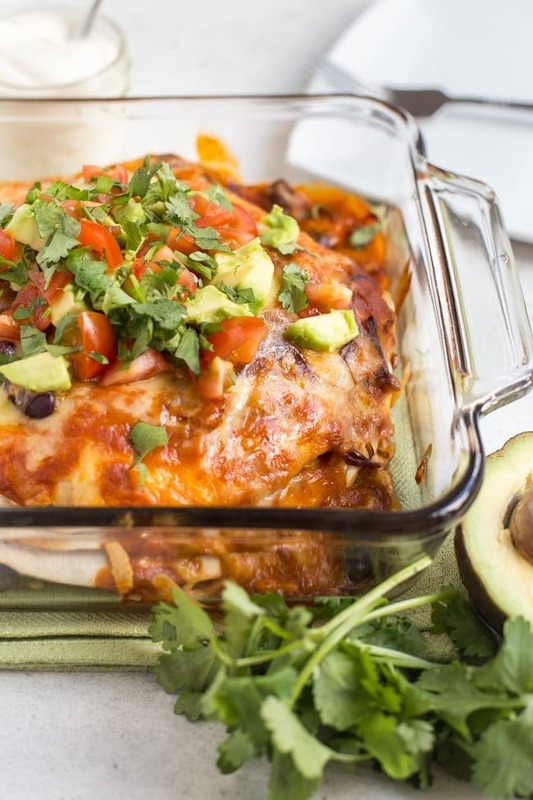 I love that you made enchiladas into a fun new “stacked” dish. I know these will be popular in my house. Yum! This looks so flavorful. I know my whole family would enjoy this dish!